Dr. Walt Griffin honored for 25 years of leadership at Limestone College. There are all the new buildings, the facility renovations, the balanced budgets, the enrollment growth, and the fund-raising goals met. 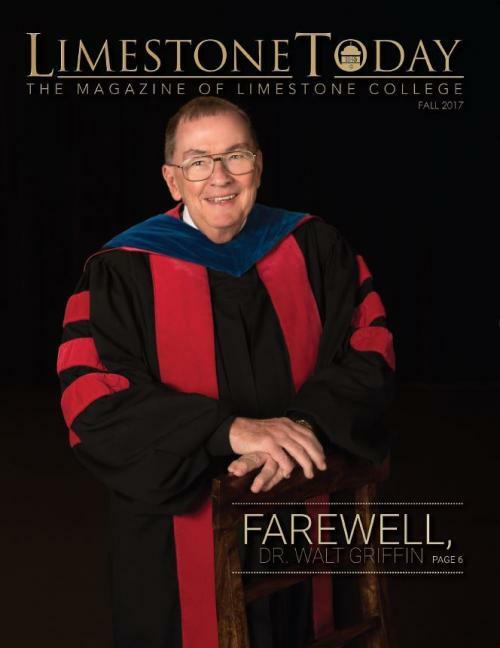 However, during a recent conversation in his office inside the Curtis Administration Building, Limestone College President Dr. Walt Griffin was asked about his fondest memories during the past 25 years. And his answers came back to the same thing time and time again. Since coming to Limestone in 1992, Dr. Griffin has stood on the commencement stage at Fullerton Auditorium and handed out the degrees and shook the hands of every single graduate. When asked to pick something that will forever define his legacy at Limestone, he points to those students. At the time of Dr. Griffin’s hiring, many wondered just how many more graduates would be able to walk across that stage. He arrived with a mission to turn the negative tide that had washed across the shores of Limestone. Over a six-year period that spanned the late 1980s and early ’90s, Limestone’s budget operated at a deficit. In those dismal days, enrollment numbers were dwindling, buildings were deteriorating, and many wondered if the College would survive. Under Dr. Griffin’s leadership, Limestone found stability and started a path to a major turnaround. The College not only recovered from those difficult times, but also flourished with a new era of growth, strength, and renewal. Limestone’s Block Program was established in 1976 to offer evening classes to working adults at several locations across the state and the region. Now known as the Extended Campus, it has flourished during Dr. Griffin’s presidency. The College was one of the first in the nation to do so when it added a virtual campus via the internet in 1996. Increasing enrollment played a major role in Limestone wiping the red ink off its books. Dr. Griffin knew full well that throughout its history, Limestone’s epitaph had been written many times, but that in each instance, the College was able to endure and even prosper. During his early years as President, there was talk that becoming a state-supported school might be the only way that Limestone could keep its doors open. “There were some, including a few trustees, who thought the answer was to turn Limestone into a state school,” Dr. Griffin said. “The thought was that the state of South Carolina would take over and all the salaries would go up and everything would be fine. But, of course, the last thing the state of South Carolina needed was another school. “Had that happened, the first thing they probably would have done is close down all the Block sites around the state,” he added. “When approached about the idea, I believe some of the lawmakers, rather than just emphatically saying ‘no,’ said, ‘Come back and see us when the school is a little stronger.’ That probably raised the hopes of some that it actually might happen. Ironically, if the school were a little stronger, it would not need the state’s support. As it turns out, Limestone didn’t need the state’s coffers to turn things around. Dr. Griffin’s plans were taking effect and more students were enrolling. That provided more resources that, coupled with greater fund-raising efforts, started to transform the College. In the past quarter of a century, no less than 18 new buildings have been constructed or acquired, and practically all the other structures have received extensive renovations. The renaissance was not confined to just brick and mortar. Limestone has been able to upgrade its faculty qualifications, going from a little over 50 percent of the faculty having terminal degrees in 1992 to up over 80 percent today. Faculty salaries have also been brought up to competitive levels. Dr. Griffin said he was particularly gratified by the growth of Limestone’s Social Work program that his late wife, Penni, was so instrumental in building – first as an Assistant Professor and Director of Field Placement in 1995, then as its Director in 1997, and eventually its Assistant Dean-Director beginning in 2002. Stepping away as Limestone’s President does not mean that Dr. Griffin will no longer be a part of the College’s family. Dr. Griffin and his late wife Penni have four children – Shawn, Megan, Rebecca, and Kathleen – and eight grandchildren.